INDICIUM DM Add-on Modules | INDICIUM Software, Inc.
INDICIUM DM’s open architecture allows you to easily add utility modules to achieve the functionality your business process needs. This unique configuration toolkit allows you to capture and control what happens between the user and the information within your system. Using a simple hot-key, INDICIUM Enabler can grab pre-selected data from the current application/dialog box, and pass it to a program which will search your database (INDICIUM DM, SharePoint, or any other database) for the corresponding document/record. The information can also be used to initiate an event trigger or workflow in another application. The Enabler can also collect audit data across multiple systems for a consolidated access log. The INDICIUM Web Server allows authorized users to access the system from any machine via the web. The Web Server provides a zero-download (thin) client, providing much of the same capabilities as a full client. This utility provides the capability to extract text from vector and text files (CAD, MS-Word, MS-Excel), as well as full-text-OCR scanned images. The module enables basic Boolean searches, fuzzy searches, and ‘near searches’ (e.g., ‘fracture near cranium’ finds all occurrences that contain both the words ‘fracture’ and ‘cranium’, and ranks the results based on the proximity of the two words to each other). 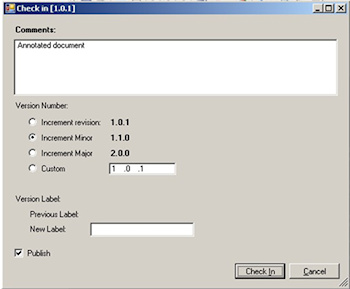 Virtually any document can be placed under version control, with major/minor or custom-label versioning. Security authorizations may be set in the Management Studio to control user access to versions. A specific version may be designated as the ‘published’ version. Connect OpenText RightFax Server to your INDICIUM DM and INDICIUM Flow applications to import incoming fax documents for processing and to store outgoing faxes (along with their coversheet and fax confirmation report) for long-term archival. The RightFax Connector can monitor multiple accounts on a single RightFax server. The Mail Connector is a service which monitors an MS-Exchange inbox for email attachments to be imported into INDICIUM DM. Throughout the day, email attachments coming into the designated inbox are automatically moved to an import queue for inclusion in the document management repository. This module simplifies batch printing from INDICIUM DM by allowing users to select multiple documents to print, freeing your users to continue working while the Print Server spools the job to the selected network printer. The Print Server utility also enables INDICIUM DM web clients to view complex files like MS-Word, MS-Excel, and CAD files without the need of the native program being installed on the user’s machine. This developer toolkit includes documentation and sample applications that may be used as is or modified to fit a custom business need. The SDK allows a programmer to interact with the INDICIUM server, allowing them to automate anything a user can do within the INDICIUM Workspace Client, including importing documents, updating document indices, and exporting documents.